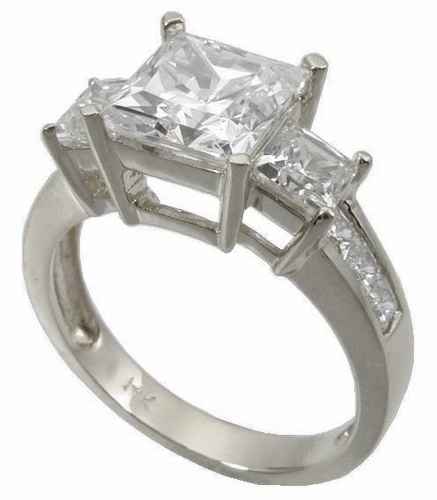 Our Winston Three Stone Princess Cut Cubic Zirconia Engagement Ring features a 1.5 carat 7x7mm princess cut square cubic zirconia center followed by a .50 carat princess cut square and a single row of channel set princess cut squares down both sides of the shank. 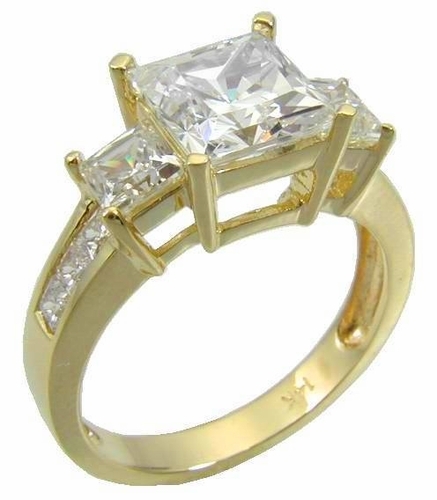 Our solid 14k gold mounting coupled with Russian formula hand cut and hand polished cubic zirconia offer a high quality product at an incredible price. This three stone princess cut ring includes approximately 3 carats in total carat weight and its shank measures approximately 3mm in width. 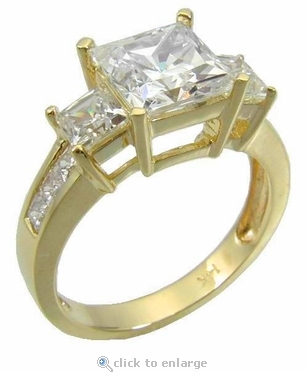 This is a fantastic ring, especially at this bargain price. Available in 14K white gold and 14K yellow gold. Please see menu options below. Due to extremely low pricing, all clearance sales are final.